My inspiration of this recipe came from the popular vegetable dish in Singapore and Malaysia, the blanched vegetable with oil & oyster sauce (油菜). I used the same method, but changed the boiled vegetable to fried fish. Kinda expected the fish dish will turn out good, and it is indeed tasted delicious, fragrant, robust, and appropriately done! I love this fish dish! Fish is always the best food for both adult and children in most cases. It contains DHA which benefits a lot to our health and brain. In order to eat fish more frequently and more excitedly, various cooking methods in SIMPLE ways are required. I would recommend using fish fillet instead of whole fish. 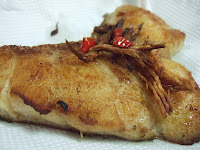 It’s easier to fry fillet than whole fish, be it deep or shallow fry and even saute method… I’ll fry whole fish only if cooking with elaborated recipe such as Thai-style sauce (smiling). Instead of frying the fish, you may also try steaming method. 1) Season fish fillet with sesame oil, salt and pepper. Well marinated, for about 10 – 15 minutes. 2) Briefly coat corn starch on both sides of fish fillet. 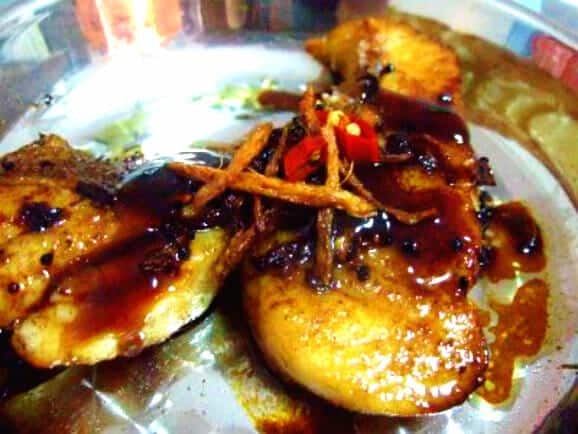 Heat wok with oil over medium fire, shallow fry or sauté fish fillet till both sides are lightly browned. 3) Remove fish fillet from wok. Drain on kitchen towel. Thereafter, place fish fillet on a serving dish. Reserve for later. 4) Clean the wok. Add vegetable oil into wok, fry ginger strips over medium heat, until crisp and golden brown. Remove from wok, and set aside. 5) Using the same wok, add shallot. Fry shallot till lightly browned over medium heat. Then, turn fire to low heat. Add garlic. 6) When both shallot and garlic turn golden browned, quickly add in light soy sauce. Add in sesame oil after the “sizzling effect” created by the mixture of hot oil and soy sauce. Heat off. Pour the sauce over fish fillet. Add oyster sauce on top of the fish. Lastly, garnish with fried ginger strips and red chili. Serve with steamed white rice. This fish dish counts 350 kcal per decent amount. Use steaming method may reduce about 100 – 120 kcal. Tips: Watch out fire, do not over-fried the shallot. Reduce heat immiedately when shallot turned lightly brown. Add garlic only now as garlic browns quicker than shallot. Then, continue frying over low heat till these two ingredients turn browned. * Brown the fish fillet over medium – low heat for about 5 min each side, or until fillet is rightly done will do. As such, the meat texture will remain juicy and not to hard to chew. * Be aware of the sizzling effect when adding soy sauce into hot oil. Oil may splash if heat is high. * You may increase the amount of oil and light soy sauce, if more sauce preferred. * You may also serve this sautéed fish fillet without the sauce as above picture on right, if preferred. I tried preparing this two days ago and it was well received by my kids whom are my official guinea pigs. However I wasted this ingredient in your recipe as I did not when to introduce it ! Please advise when to add it. Sorry I omitted this step.. Hee..
You may add it when shallot is fried till light brown. Then, add garlic to further brown both.